EI9FBB, our local DXCC card checker, was kept busy. Logbook of the World. 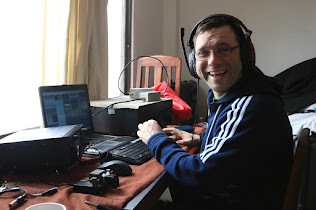 Pat EI2HX gave us an excellent introduction to Amateur Television, showing us some of his collection of antennas, transmitters, receivers and connectors. For those in the audience more used to working with equipment designed for Kilohertz or Megahertz frequencies, the "Gigahertz" hardware Pat works with seems almost exotic. to ensure the integrity of the system.